Best of luck to Tarah O'Sullivan, Hannah O'Neill and their Dublin team-mates when they take on Cork in the All-Ireland Minor Football A final on Monday. It's always a privilege to have club players playing in an All-Ireland final, but this game is even more special for the club as Tarah is the captain of the team. The game is taking place in Pearse Park, Longford at 4:45 p.m. and it'd be great to see a large turnout of club members at the game. For those unable to make it to Longford, the game will be televised live on TG4. Best of luck Tarah and Hannah! Commiserations to Lisa Davies and Jodi Egan who were on the Dublin U16 team that lost to a very strong Kerry team in the All-Ireland Final on Wednesday. The senior county final has been fixed for Friday September 2nd at 8:15 p.m. in Parnell Park where, like last year, St. Brigid's will be the opponents. The club will be running buses to the game and this is being coordinated by Paul Ryan and Colette O'Keeffe. Paul and Colette will be in contact with the various teams in the coming days. The senior team will be holding a Table Quiz on Thursday August 18th @ 8:15 pm in The Grange Pub, Deansgrange. A table of 4 costs â¬40 and a great night's fun is assured! Next Sunday evening we will be playing one of European Ladies team who will be taking part in the 2016 GAA World Games. The Foxrock Cabinteely team will be managed by Denise O'Connor and training has stepped up a gear or two in preparation for the game. The LGFA has been in contact with the club looking for volunteers to act as lines persons and umpires for the upcoming GAA World Games. Any member interested in helping out should email chairman@foxcabgaa.ie before noon on Wednesday Aug 3rd. On Friday morning our club secretary, Linda Carroll, received a mail to let her know that the club had won â¬1000 in the LIDL in-store promotion. This is a very welcome boost to the club finances. Thanks to all members for their help and assistance with this. Â· â¬40 for a third child. Each participant will receive a free GAA Backpack and gear. This camp is proving to be as popular as the first camp, so early booking is advised by clicking here. Congratulations to our senior team and management on their fantastic win over Kilmacud Crokes in the championship semi-final on Wednesday night last. The final score was Foxrock Cabinteely 2-12 Kilmacud Crokes 0-13. This win sees our senior team qualify for their third consecutive senior county senior final and their fourth final in five years. The game was a repeat of last yearâs semi-final, and, like last yearâs game, was a ding-dong battle between 2 very committed teams. Crokes were the form team coming into the game having qualified from a very competitive group which saw them scoring 14-53 in the 4 games that they played. Crokes started very well and raced into the lead but our ladies didnât panic and gradually got back into the game. Scores were exchanged through the game but 2 goals from our hard working forward line at crucial stages of the game gave the team some breathing space. Crokes tried hard to claw back these goals but the backs took everything that was thrown at them and held on to win. Thanks and well done to referee Paul Flanagan on a job well done. The date for the final has yet to be confirmed, but itâs likely to be either Wednesday August 31st or Friday September 2nd where the opponents will be â like last year â St. Brigidâs. Brigidâs had an unbelievable win in the semi-final when they beat a highly fancied Ballyboden St. Endaâs after extra time. Members will be informed once the date and venue has been confirmed and we appeal to ALL club members to come along and support the team in the final. Last September we brought over 300 members to see Dublin play Cork in the All-Ireland Ladies Senior final last year so thereâs no reason we canât surpass this number for this yearâs county final. Car flags have been ordered and should be delivered in the next week or so. If youâd like to order some, please send a mail to registrar@foxcabgaa.ie and Niall will look after you. 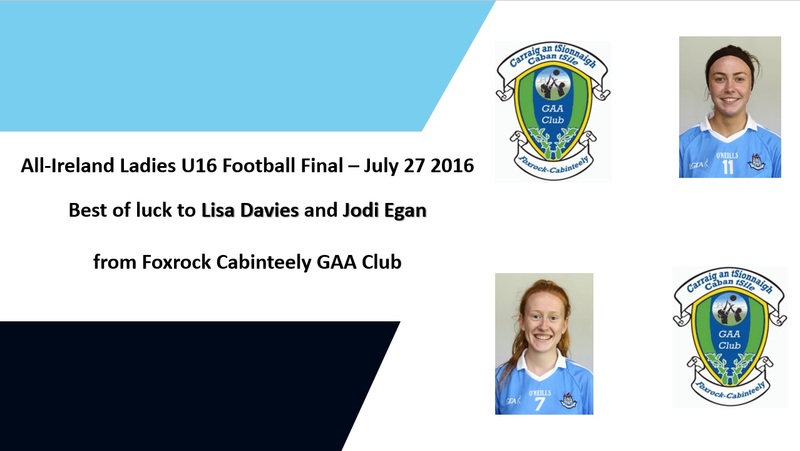 Best of luck to club players Lisa Davies and Jodi Egan and their Dublin team mates when they take on Kerry in the U16 All-Ireland Final on Wednesday evening in Nenagh, Co. Tipperary. Both Lisa and Jodi have played pivotal roles in Dublin's march to the final. These are just SOME of the comments received during and after our CÃºl Camp. Well done to Jane OâConnell Bell and her CÃºl Camp team on what was a terrific week in Kilbogget Park. A summary of the week is available here and pictures from the week are available here. Bookings for the second camp â from August 15th to 19th â can be made here. Members are advised to book as soon as possible as a lot of the participants on last weekâs camp have already registered for the August camp so places are filling up fast. Like the first camp, we may have to close registration early. The 2016 Eithad Airways GAA World Games, takes place between August 7 and 14 at UCDâs Belfield campus, with the finals being played at Croke Park. 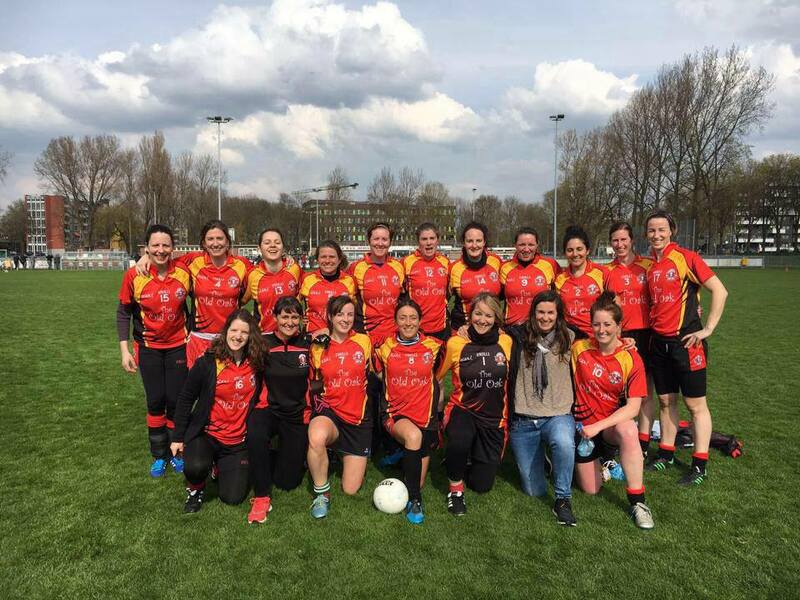 This year Europe are entering 2 Ladies GAA teams in this competition and one of these teams is managed by our own Marla Candon. Marla has been putting her charges through their paces for the past few months and their intensive preparation will conclude with a challenge game against Foxrock Cabinteely. The game will take place in Kilbogget Park on August 7th. Throw in time has to be confirmed, but members are asked to mark this unique event in their calendar and make their way to Kilbogget for what is sure to be a festival of football. You can follow the European team here on Facebook. Have a look at their page and let them know that weâre looking forward to welcoming them to Foxrock Cabinteely GAA in a few weeksâ time. 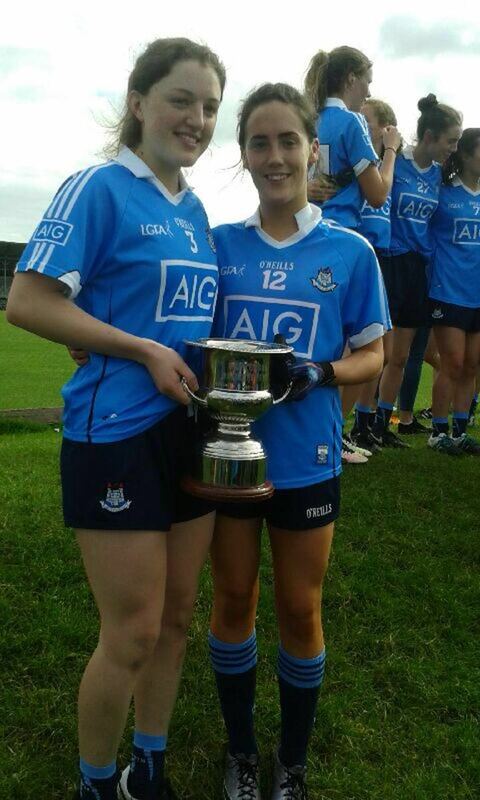 Congrats to Tarah O'Sullivan and Hannah O'Neill who were members of the Dublin minor team who beat Armagh in the All-Ireland semi-final on Saturday. The final score was Dublin 4-21 Armagh 1-09. Hannah scored 1-2 of the Dublin total and her magnificent goal can be viewed by clicking here - forward to 2 minutes into the video. As a result of this win, Tarah will have the honour of leading out the Dublin minor team in the All-Ireland final on August 1st against Cork. The venue has yet to be confirmed. Our senior team take on Kilmacud Crokes in the Dublin senior championship semi-final on Wednesday evening at 7:30 in Kilbogget Park. This is a repeat of last years semi-final where our ladies just about came out on top after a titanic battle. Crokes finished as runners up in a very tough group and scored an incredible 14-53 in the games that they played. As well as that, they have numerous county players on their team - they had 8 players on the Dublin U21 team that won the All-Ireland a few weeks ago and also have key players on the Dublin ladies senior team. We would urge all club members to come along and support our seniors in what will be a very tight encounter. All the hard work and planning has been done and on Monday morning (July 18) our CÃºl Camp team are looking forward to welcoming almost 100 children to Kilbogget Park for our first CÃºl Camp of the summer. Each participant will receive a GAA Backpack and gear. Participants will be delighted to know that the gear has been delivered safe and sound and Jane O'Connell Bell and her hard-working team are looking forward to distributing this during registration on Monday morning. 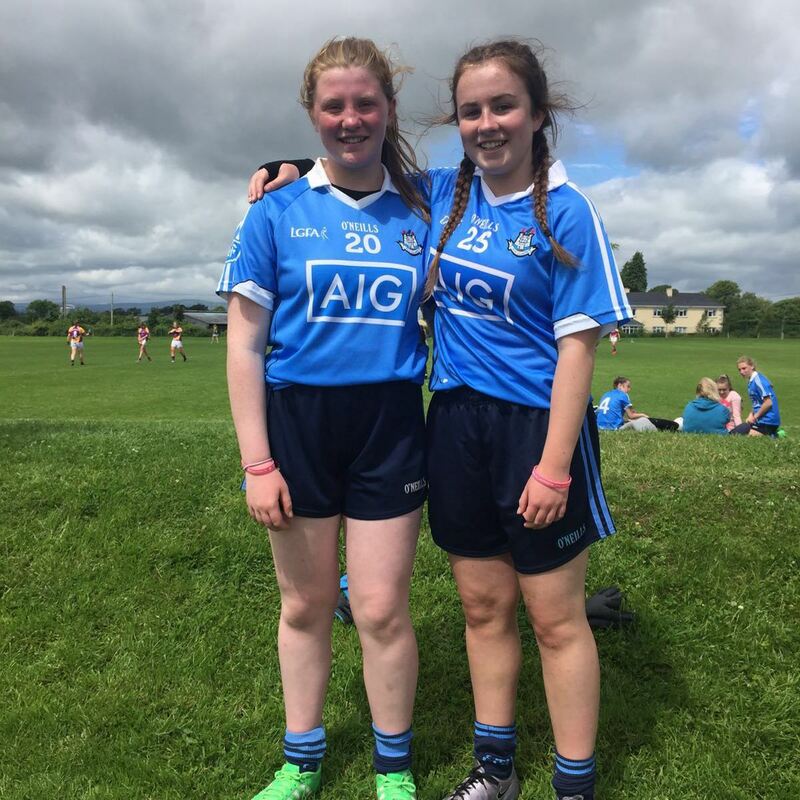 Well done to Aisling O'Kelly and Ava Egan who played for Dublin in the Leinster U14 blitz on Saturday in Portlaoise. Members are reminded of the LIDL and Topaz promotions. Your support for the club in these promotions would be greatly appreciated. Congratulations to the Dublin Ladies Senior team - and particularly Sinead Goldrick, Niamh Collins, Niamh Ryan, Amy Ring and Amy Connolly - on winning the Leinster senior championship earlier today against Westmeath. Sinead scored 1-1 of the 4-21 that Dublin scored today. Today's win saw Dublin complete the five-in-a-row in Leinster. Today's win sees a remarkable 9 Leinster medals coming to the club in the past 3 weeks. Not bad for a club that's only 11 years in existence! Commiserations to Fiona Claffey who was on the Westmeath team. Commiserations also to Ciara NÃ­ Mhurchadh and her Kerry team-mates who lost the Munster final to Cork. Well done to club players Lisa Davies and Jodi Egan and their Dublin team mates on winning the All-Ireland semi-final on Saturday. Both girls have played key roles in Dublin's success to date. The final is scheduled for Wednesday July 27th where they will play either Kerry or Mayo. We had an overwhelming response to our CÃºl camp from July 18th to July 22nd and, unfortunately, have had to close registration early. However, Jane OâConnell Bell has been working with Parnell Park and has managed to secure a second camp for us from August 15th to 19th. Registration is now open for this camp and bookings can be made by clicking here. 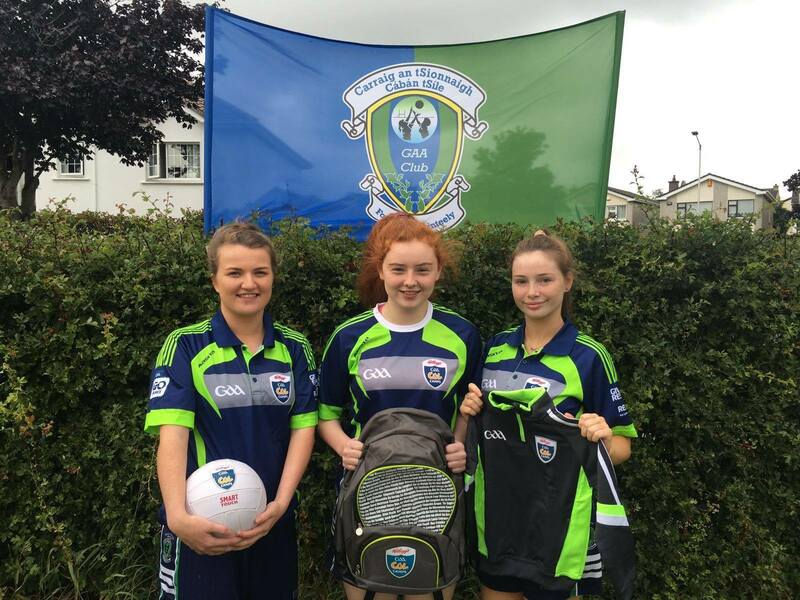 As proud supporters of Ladies Gaelic Football, Lidl are delighted to support the grassroots of the game! Having already donated over â¬250,000 worth of jerseys & equipment to Post Primary Schools, the focus is now on clubs. They have already picked the first winner & they are now giving clubs another chance to win â¬5,000 in funding. To be nominated, all we have to do is nominate Foxrock Cabinteely on the LIDL Facebook page and tell them what â¬5000 would mean to us. We've already been nominated for this round - click here to view the video we've submitted - but a club can be nominated more than once. Following on from Dublin's U16 Leinster championship win last week, the minors emulated that victory today with a hard fought victory over Westmeath. Similar to last week, the club had players starting at full back and half forward. Congratulations to Tarah O'Sullivan (full back) and Hannah O'Neill (left half forward) on their victory today. It's always great to see Dublin win a championship, but it's even more special when "one of own" is presented with the trophy. Tarah was appointed as minor captain at the start of the year and she had the honour of accepting the trophy today on behalf of her team mates. While Dublin won easily in the end (6-22 to 4-9 - 3 of the points coming from Hannah) the game actually went to extra time. Dublin have now qualified for the All-Ireland semi-final which is currently scheduled for July 16th. We wish both Tarah and Hannah all the best in the remainder of the championship and hope that Tarah will have the opportunity to lift the All-Ireland trophy later in the year. As called out in last week's notes, both the Dublin Ladies and Men's Senior Football teams have qualified for their respective Leinster finals - both against Westmeath. The ladies final is scheduled for July 10th and the men's final is scheduled for July 17th. All Foxrock Cabinteely GAA Club members know just how brilliant Sinead Goldrick, Amy Connolly, Amy Ring, Niamh Collins and Niamh Ryan are. Wouldn't it be nice though if the GAA community in Dublin, Westmeath, Leinster and beyond got the opportunity to see these ladies play? A petition has been started to get both games played on July 17th. If you agree with this, please click here to sign the petition. To be nominated, all we have to do is nominate Foxrock Cabinteely on the LIDL Facebook page and tell them what â¬5000 would mean to us. We've already been nominated for this round - click here to view the video we've submitted - but a club can be nominated more than once - hint hint members! !